How have streamers impacted/influenced studios? When Ark was released the studio had no marketing budget. Just uploaded gameplay with FRAPS to YouTube. Day 1 Lirik got in touch and after that, the streamers were the ones promoting the game on their own. Works from home and always has 1-2 streams open. It’s important for them to keep a good relationship with streamers. It’s not only content but Esports for them. They’re partnered with Twitch for the Rocket League Championship Series. It’s important because when the players aren’t competing most of them are streaming on Twitch. In their studio office, the first thing you see is a big TV streaming different Rocket League channels. Warframe is updated regularly and Twitch has been a great way to find things that may need fixing. It’s also a great way to display the great work that’s being done to other departments. For example, the Art team doesn’t always see what awesome things the streamers are doing and being able to share clips/streams to them is nice. For Epic Games, it’s been a learning experience. A few years ago they had a different approach. It’s a culture shift when you have the president of the company reference a livestream he saw when addressing problems. From a development side, more of the team is being focused on how the game can be better for streamers (e.g. drops/extensions) and also for making it more entertaining for viewers. 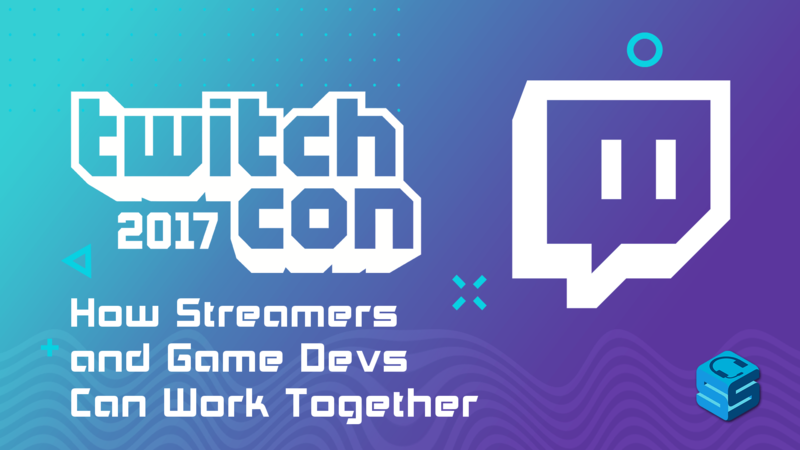 As CMs they have to spread the word about Twitch to the Executives and other people that know little to nothing about Twitch. How do you find streamers to work with? Warframe has a large partner program. Word of mouth from enjoying Warframe either as a viewer or another streamer. The game has been around for awhile so right now they don’t really go out and find streamers. They focus on how the streamer interacts with the audience. Even though Rocket League is ‘E’ for Everyone that doesn’t mean they look for only PG streamers but they try to blend both the audience of a particular streamer with the audience of the overall game. The Rocket League subreddit is a great hub for players from all areas of the internet. They’re pretty open with just opening up Twitch and seeing who is streaming the game. He generally looks for newer streamers to Ark. Working with their PR company to develop an Ark Influencer program. Consistency with the content is important. Looks for people that are involved with not just the game but the community. Know the type of audience you want and the type of content you want them to create. At a general level, positivity is important. Makes it easier to work with than someone who is more toxic. What are the best ways to communicate with CMs/devs? Best ways to initially get in touch is Twitter. Easy and quick way to get attention. Email is still the most important. If you don’t already, make sure to have your Email easily accessible on your Twitter page and Twitch page. Editor’s note: Check out our article for how to communicate with PR/devs as a streamer. How are developers/CMs promoting streamers? Biggest one is social media promotion. Epic Games doesn’t have a streamer program that has strict guidelines. Will work with streamers that are just awesome people. Do raids for streamers where they’ll drop items only for that channel for a certain period of time. Invite people out to their headquarters for a grand tour. Workshops to help content creators hone their skills. Epic Games is also about connecting influencers with other developers within the Unreal Engine realm. Has the Warframe partner program. When the requirements are met people are accepted. Partnered influencers get early access to upcoming items to make content with. Glyphs in Warframe are icons that can be given out to your community to spread your brand. Other perks to give to their viewers such as Platinum (in-game currency) and merchandise. The Drop system allows them to reward viewers for watching their favourite streamers. Getting certain items when their Twitch and Warframe is linked. On a smaller scale they make sure their influencers have lots in terms of game keys, merchandise, etc. Social Media promotion is the most common. Don’t have a partner program but influencers have an unofficial relationship with the developers. Fairly easy for them to get in contact to request things such as keys to give away. Can fly people out to trade shows to maybe stream live at their booth. How has livestreaming influenced your game’s development? When eSports events are going on they can be directly broadcasted in the game. Because many of the customization items are bright and flashy, it works with streaming since there is always something new to look at. Viewers enjoy seeing the latest new item. Aside from Twitch drops, Warframe partners will be some of the first people to let developers know of any problems with the game. They have almost a direct line to the game’s development. Nothing currently integrated directly in the game (yet). Has both game drops and drops in the chat via a bot. Looking at ways to develop future games in a way that makes it easier to broadcast. As a survival game, they needed to develop a way to hide servers to prevent unwanted viewers from ruining their experience. Initially had a large story element in Ark but as livestreaming influenced the game they realized how important the player interaction events were. Gave people things such as spectator tools to capitalize on those moments. What is some advice for people who are shy/introverted that want to contact you either in person or email? Introverted herself. It can be scary but you have to remember the community managers are some of the easiest people to talk to. They’re all wanting to talk to everyone. They’re at conventions to talk to people. Doesn’t have to be complicated. Introduce yourself, talk about the game, and it’s also polite to not start the conversation with asking for something. Editor’s note: Check out our convention tips for content creators. Business cards are important and can help lessen the stress on you having to explain everything yourself. Make sure to still introduce yourself though as community managers want to start a relationship with you. Even if you’re extremely shy, most community managers can help carry the conversation for you. How much of an emphasis do you put on streamers that may not have the biggest numbers but maybe focus more on problems with the game (ie. bugs)? For Rocket League it is something that’s paid attention to but because the subreddit is such a hub for communication, megathreads are made to list problems that get sent to developers directly. For streamers it’s not always about bugs but there are certain streamers that specialize in things such as trick shots. Epic Games has a similar process to Rocket League developers. Reddit is another large hub of communication and Clips of bugs from different streamers tend to get thrown there. With the Warframe Partner program there is a Discord where direct communication is easily attainable if bugs arise. What value do you guys see in smaller broadcasters and what can they do to appear more approachable for companies? What tends to happen is that high viewership streamers are not playing the games for the long haul. Most of the top streamers are variety and they’ll “ride the wave” to increase viewership. They look for smaller broadcasters that are playing the game for the long-term and truly enjoy it. Don’t undervalue yourself. As long as you put in the work into a game you’re passionate about you will find growth. Larger streamers are good for a push in numbers but the community is made up of the smaller broadcasters. What is the most important information to include when contacting a CM/Dev? Likes people that have goals. Don’t ask for keys without offering something. Are you going to make guides? Are you humorous? Explain what your long-term plan is. Make sure to always have your channel/social links in the email. If you’re interested in the game tell them why. Community Managers want to know that you’re plugged into the game and know you’re paying attention to it. Direct links to your channel/social media make things easier. Clips are great to show off highlights of you playing the game and can pique the interest of CMs/Devs. What is the biggest challenge in forming a relationship with influencers? Trying to create a relationship that’s long-lasting. You want the streamer to play the game long term and be passionate about it. What are the steps you take to prepare for a big update for your game? Depending on the update and the goals. Have to ask themselves what is in the update and which content creators are best suited to showcase it. Large updates will sometimes have a Test build/realm for content creators to get early access.